Sleep habits like other behaviours, need to be learned. It is important to introduce a bedtime routine as it teaches your child the order of events leading up to bedtime and can help prevent sleep problems later on. If you put your baby down in their cot whilst they are awake they will learn how to fall asleep without the need for rocking or cuddling them to sleep. If they get used to falling asleep in your arms, they may need nursing back to sleep if they wake up again. Good night kiss and cuddle. 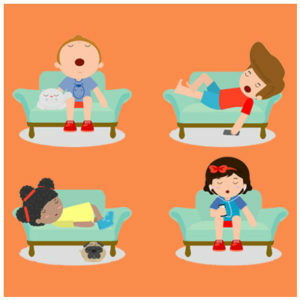 A bedtime routine should not include lively games, or a television. You could leave a dim light on if necessary. Children who wake during the night have learned that if they cry, something nice will happen. The nice things might be a cuddle, drink, or simply seeing you. Any of these things will make it more likely that your child will continue to wake in the night.